Vinyl LP is limited to 500 copies. 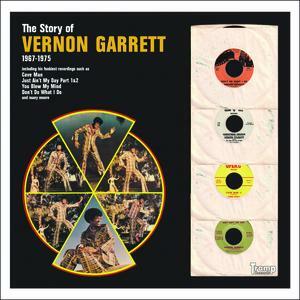 So why don't you know who Vernon Garrett is? You really should know. He has a smooth silky voice, a stage presence so professional he should give lessons, a smile as big as Texas, and has sold more records than most of the blues people you can name. It's time you found out about Vernon Garrett. It's past time. So here is Vernon's story. Vernon became aware of his love for music and entertainment at the early age of 10. He was inspired by the great talent of Ray Charles, Big Joe Turner Lowell Fulsom, to name a few. It was during these times he would sneak into the rear of venues to listen to these great entertainers. He has then decided entertainment was his calling, his gift became reality. Like most singers, his roots began in the church singing Gospel music. He later became lead vocalist for the gospel quartet, the renowned "Swan Silvertones". After serving in the United States Navy, Vernon relocated to the entertainment capital of the world, Los Angeles, California where he began his entertainment career as a very talented singer and percussionist. He later joined the up and coming group of the time, "The Sliders". Vernon's inspiration prompted him to began entering many talents shows in the area, and won most of them. He competed with such talented blues singers as Bobby Blue Bland, Ted Taylor, B.B. King, and many others. It was at one of these shows that he met the very lovely, Jewell Whitaker, a promising female vocalist, and she later became his wife, and singing partner. "Vernon and Jewell" enjoyed a successful singing career, travelling throughout the United States, Canada, and Alaska in the 1960s. After the untimely death of Jewell, Vernon continued his singing career, solo, and recorded several 45s and even two 33 1/3 albums between the early and late 1970s.